Love for our pets has reached epic heights - special pet taxi services in Mumbai, sick leave for dogs in Italy, emotional support peacocks in the US - so it should come as no surprise that our four-legged friends have infiltrated our entertainment habits as well. 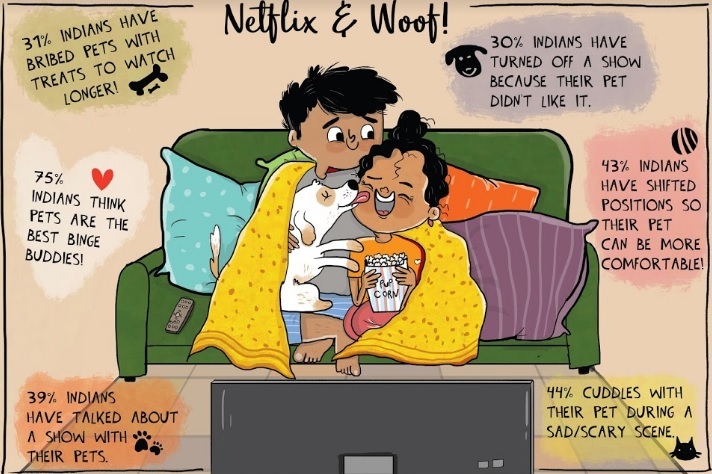 According to a new survey released by Netflix, when it comes to watching TV, most Indians (75%) find pets to be the best binge partner. 88% of Indian members have watched Netflix with their pets, as compared to 74% globally. After all, watching a show with pets mean no spoilers and no cheating. The best binge paw-tner? You bet! Not only do pets not hog the remote or judge your entertainment tastes (well, maybe), they make the perfect partners for the company, the cuddles (44% of Indian members have turned to their furry friends for comfort during a sad or scary scene) and even the conversation (39% have talked to their pet about the show or movie they were watching). Though you should be warned that pet bingeing can also be ruff. A considerable number of respondents (43%) have moved from where they were sitting, so their pet would be more comfortable, several (31%) have bribed them with treats to watch longer, and some (30%) have even gone so far as turning off a show because their pet didn’t appear to like it. The snuggle is real. So what are the shows everyone is barking and meowing about? Dog and cat owners in India are likely to go for comedy with a high dose of drama and adventure. Bring on Friends from College, Alias Grace, and A Series of Unfortunate Events. The one show that brings all streaming species together is Stranger Things...#justiceformews. Looking for some brand new shows that you can now stream or download to watch with your partners and paw-tners? We recommend Lost in Space (premiering April 13) for a thrilling journey with the Robinson family. The survey was conducted by SurveyMonkey from January 9-25, 2018 and based on more than 50,000 responses. The sample is representative of an adult online population who watch Netflix with their pets in Argentina, Australia, Brazil, Canada, Chile, Colombia, Denmark, France, Germany, India, Ireland, Italy, Mexico, Netherlands, New Zealand, Peru, Poland, Portugal, Romania, South Africa, South Korea, Spain, Sweden, Thailand, Turkey, USA, UK.